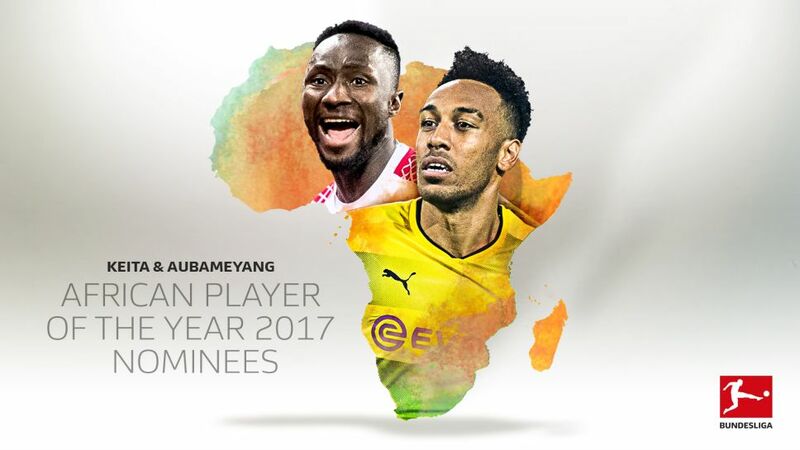 RB Leipzig's Naby Keita and Borussia Dortmund's Pierre-Emerick Aubameyang have been nominated for the 2017 African Player of the Year award. Borussia Dortmund's Pierre-Emerick Aubameyang and RB Leipzig's Naby Keita have both been shortlisted for the African Player of the Year award, the winner of which will be announced on 4 January. Aubameyang, who won the award in 2015 and finished second in 2014 and 2016, is bidding to become only the sixth player to win the award more than once, while Keita is in the running for his first individual accolade after being named on a 30-player shortlist. Current head coaches and technical directors of the affiliated nations of the African Football Federation (CAF), together with a panel of media experts, will decide on the winner, who will be crowned in Accra, Ghana, early next year. Gabonese forward Aubameyang, who is joint-top of the current season's Bundesliga scoring charts with ten, having won the coveted Torjägerkanone ahead of Robert Lewandowski with 31 goals last season, has found the back of the net a total of 25 times in the current calendar year. Keita was inspirational in Leipzig marching from Bundesliga 2 into the UEFA Champions League at the first time of asking last season, tallying eight goals and as many assists as the Bundesliga newcomers finished runners-up to Bayern Munich. With such outstanding records, both are considered to be among the leading candidates to walk away with the honour.